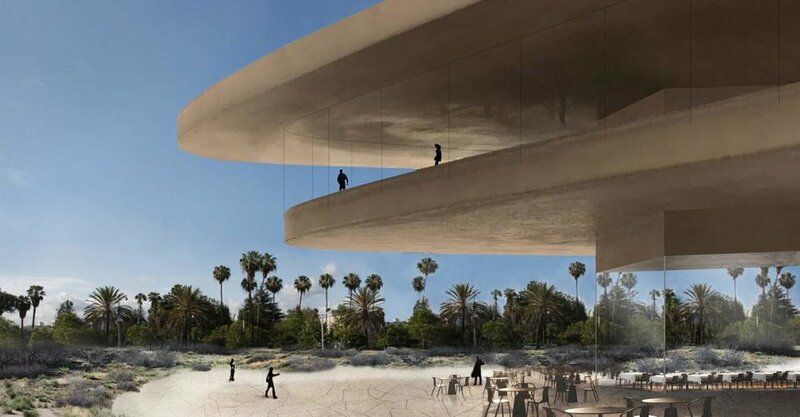 At the end of October, the Los Angeles County Museum of Art (LACMA) released the latest and most detailed set of renderings for their proposed redesign by Swiss architect Peter Zumthor, and as the renderings get more and more polished the unresolved shortcomings of the design are becoming ever more glaring. The conceptual origin of the project remains strong, with the amorphous shape and lack of any spatial hierarchy breaking with the traditional linear, chronological arrangement of similar encyclopedic museums. Since Zumthor’s involvement on the project was first announced, and before there were any images to critique, he’s been talking about upending traditional conceptions of what an art museum could be. That desire, and the strength of those ideas remain evident, even as the original black blob (inspired by the neighboring La Brea Tar Pits) has morphed into a sand-colored S-shape stretching across Wilshire Boulevard. But as the design has progressed, many of the details that will make or break the building’s success still seem like afterthoughts. This is most recently exemplified by the inclusion of curtains in some renderings to address light control concerns in the perimeter circulation and gallery space. Despite the deep overhanging roof, morning and afternoon sun will be blasting through the east- and west-facing floor-to-ceiling windows on a near daily basis, requiring curtains to be drawn in portions of the building to protect valuable artworks. The transparency of these perimeter gallery spaces has always been one of the key highlights of the proposed design, creating visual connections both inside-out and outside-in. But with curtains drawn, those visual connections are eliminated, or at best segmented, depending on the time of day and position of the sun. The jewel box becomes a peep show. Even with the curtains open, the infinite, sinuous glazing portrayed in the renderings would be clumsily broken with intermittent bunches of fabric. It’s no wonder these curtains are never shown on any of the interior renderings. Interior rendering, without any curtains in sight. Image via LACMA. All of this also begs the question of who will be responsible for opening and closing the curtains. This is no minor concern when the preservation of a multi-million dollar artwork is at stake. It could be an extra task for the museum staff who already patrol the galleries to make sure patrons don’t get too close to the art. Or there could be an automated system that opens and closes the curtains. Both options have benefits and drawbacks, but the complex decision-making required (How much light is too much light? Is it okay to keep the curtains open on a cloudy day? Which artworks can tolerate direct sunlight, and which can’t? ), and the potential for failure in either case presents a major challenge for an institution charged with the stewardship of important artworks. This may be one of the reasons there have been reports that museum curators are concerned about the design. An earlier rendering, showing a desert-like landscape. Image via LACMA. If so much discussion of something so seemingly trivial as curtains reads like making a mountain out of a molehill, I would only say that this question of light control is indicative of other similarly unresolved issues with the design. Despite a handful of recent rendering showing impossibly transparent cafes, and newly created open spaces underneath the building, the issue of how the building meets the ground is still largely unresolved (or at least uncommunicated). In theory, visitors can enter through any of the seven pavilions that support the elevated gallery spaces, but the actual entry sequence remains a mystery. And the imagery of the design so far seems to sometimes rely on lazy tropes of Los Angeles, as a city entirely beholden to cars (bridging across Wilshire Boulevard, not unlike a freeway overpass), or a city built on a desert (critic Alexandra Lange recently remarked on Twitter how one rendering appeared to show the building in a "desert oasis," uncharacteristic of LACMA’s setting in the Miracle Mile district). Zumthor’s most powerful work has always been characterized by a masterful level of rigour and refinement. This fact only makes the oversights noted here all the more alarming. At the same time, all of his previous work has been significantly smaller than the LACMA project, and has faced much less scrutiny during the design process. Unlike previous attempts to remake the LACMA campus (Rem Koolhaas’ quixotic vision, or Renzo Piano’s half-fulfilled vision), with museum director Michael Govan at the helm, and large donations already secured, Zumthor’s design has a real chance of seeing completion. The LACMA project could be the crowning achievement of a great architect’s career, or a white elephant that relegates him to a niche status. I only hope the final product lives up to Zumthor’s reputation, and provides Los Angeles with the masterwork the city, and the museum, deserves. For more on the museum's redesign, check out Building LACMA. Or find more reporting on the latest batch of renderings here, here, and here. Connect with people[PLACES]spaces on Twitter, Facebook, and Instagram.